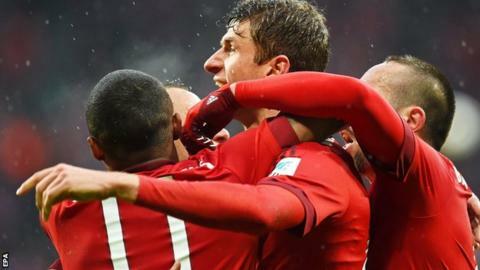 Thomas Muller's two goals - including a stunning overhead kick - helped Bayern Munich go 11 points clear at the top of the Bundesliga as they beat Darmstadt. The visitors took a surprise half-time lead with a header from former Bayern youth striker Sandro Wagner. Muller converted Rafinha's cross early in the second half, before scoring spectacularly from Arturo Vidal's chip. Robert Lewandowski struck late on to give Bayern the win ahead of Tuesday's Champions League trip to Juventus. Bayern boss Pep Guardiola is leaving for Manchester City this summer - and a banner at the game read: "Pep was never our thing"
Pep Guardiola had thoughts of the round-of-16 first-leg visit to Turin as he named a team without captain Philipp Lahm, who was rested. Bayern dominated possession and had 36 attempts at goal - the highest by any team in a single Bundesliga match this season. Darmstadt keeper Christian Mathenia, though, made a series of excellent saves, while Vidal and Kingsley Coman both hit the bar with deflected first-half shots. Guardiola, though, will be pleased with the way his team responded to trailing at half-time - and even though they had to wait until 19 minutes from the end to go in front, their victory was pretty comfortable in the end. Borussia Dortmund, in second place, will seek to cut Bayern's lead when they visit fourth-placed Bayer Leverkusen on Sunday. Germany international Muller was the catalyst for Bayern's second-half revival with two excellent finishes. His first was clinical - controlling and firing past keeper Mathenia three minutes after half-time - while his second was wonderful. Muller had his back to goal when Vidal's diagonal chip reached him, but he somehow fashioned an overhead kick that left the goalkeeper helpless. That laid the platform for Bayern to secure the win, with the prolific Lewandowski - who had earlier seen a goal ruled out for offside - touching in Franck Ribery's pass with six minutes to go. The visitors, who are just above the relegation zone, came out of the game with great credit, having been without five players serving one-match bans. Those suspensions had caused a degree of controversy in the build-up, with coach Dirk Schuster dismissing suggestions that his players had got booked deliberately so they could serve their bans against Bayern and be back for next weekend's important trip to relegation rivals Werder Bremen. Schuster could be encouraged with the spirit his side showed, and they gave Bayern a fright by taking the lead with their first shot on goal, as Wagner headed in Sandro Sirigu's cross. Hoffenheim's new 28-year-old manager Julian Nagelsmann picked up his first win since taking charge nine days ago, as his side increased their survival chances by beating Mainz 3-2. Mark Uth scored twice to leave Nagelsmann's team just two points below the relegation play-off spot, occupied by Werder Bremen, who lost 2-0 at Ingolstadt. Hertha Berlin moved above Bayer Leverkusen into third, as former Chelsea forward Salomon Kalou struck an equaliser in a 1-1 draw at home to Wolfsburg.Borussia Monchengladbach are fifth after beating Cologne 1-0. Match ends, FC Bayern München 3, SV Darmstadt 98 1. Second Half ends, FC Bayern München 3, SV Darmstadt 98 1. Substitution, SV Darmstadt 98. Benjamin Gorka replaces Fabian Holland. Corner, FC Bayern München. Conceded by Christian Mathenia. Goal! FC Bayern München 3, SV Darmstadt 98 1. Robert Lewandowski (FC Bayern München) right footed shot from very close range to the centre of the goal. Assisted by Franck Ribéry. Júnior Díaz (SV Darmstadt 98) wins a free kick on the left wing. Substitution, FC Bayern München. Xabi Alonso replaces Arjen Robben. Attempt missed. Arjen Robben (FC Bayern München) left footed shot from the centre of the box is just a bit too high. Assisted by Franck Ribéry. Attempt saved. Douglas Costa (FC Bayern München) left footed shot from the centre of the box is saved in the top right corner. Assisted by Juan Bernat with a cross. Corner, FC Bayern München. Conceded by Júnior Díaz. Attempt saved. Sandro Wagner (SV Darmstadt 98) right footed shot from outside the box is saved in the centre of the goal. Substitution, SV Darmstadt 98. Marco Sailer replaces Sandro Sirigu. Tobias Kempe (SV Darmstadt 98) wins a free kick on the left wing. Goal! FC Bayern München 2, SV Darmstadt 98 1. Thomas Müller (FC Bayern München) right footed shot from the centre of the box to the top left corner. Assisted by Arturo Vidal. Attempt saved. Tobias Kempe (SV Darmstadt 98) right footed shot from the right side of the box is saved in the centre of the goal. Assisted by Sandro Wagner. Foul by Sandro Wagner (SV Darmstadt 98). Corner, FC Bayern München. Conceded by Fabian Holland. Attempt blocked. Douglas Costa (FC Bayern München) left footed shot from outside the box is blocked. Assisted by Rafinha. Attempt blocked. Arjen Robben (FC Bayern München) left footed shot from the left side of the box is blocked. Assisted by Franck Ribéry. Attempt saved. Arjen Robben (FC Bayern München) left footed shot from the left side of the box is saved in the bottom left corner. Assisted by Juan Bernat. Foul by Fabian Holland (SV Darmstadt 98). Offside, FC Bayern München. Juan Bernat tries a through ball, but Franck Ribéry is caught offside. Substitution, SV Darmstadt 98. Jan Rosenthal replaces Mario Vrancic. Offside, FC Bayern München. Arturo Vidal tries a through ball, but Robert Lewandowski is caught offside. Attempt missed. David Alaba (FC Bayern München) left footed shot from outside the box is too high. Assisted by Rafinha.